Historian Babett Edelmann-Singer studies how cult objects become material expressions of power. Later this year, she joins the School of History at LMU as a Heisenberg Fellow. 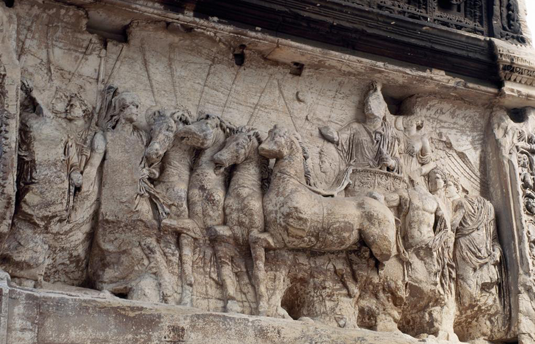 When the Seleucid king Antiochus IV Epiphanes (God Manifest) held a triumphal victory parade before the walls of his capital Antioch in 166 BC, he was not inclined to be abstemious. According to contemporary accounts, the event certainly wasn’t marred by modesty. Some 50,000 warriors – soldiers and mercenaries – took part, thousands of them equipped with Roman armor. They were complemented by several hundred gladiators and dozens of elephants. Naturally, the procession passed through Daphne, the district in which the city’s richest citizens resided. After all, its primary purpose was to demonstrate the extent of the king’s resources and the range of his political influence, which extended from Asia Minor through Syria to Persia. But perhaps the most striking feature of this procession is the fact that it was not occasioned by a military triumph. The Seleucid armies had indeed recently penetrated far beyond the borders of Egypt. But they had been forced to bow to Roman pressure and withdrew before they reached Alexandria. So this most remarkable of all triumphal processions in classical times has since been seen, above all, as a political response to the threat posed by the growing power of the Romans in the Eastern Mediterranean. Historian Babett Edelmann-Singer, who will join the School of History at LMU in fall as a Heisenberg Fellow of the Deutsche Forschungsgemeinschaft (DFG), sees another element at work here. Her research centers on the implicit meanings of objects in the Classical Period. How, for example, should one interpret the fact that, of the 300 or so cities of the Seleucid Empire and the rest of the Greek world, most were symbolically represented in the procession by images of their gods? Edelmann-Singer argues that this emphasis on the display of religious objects must be understood as part of a political program: For her, the central goal of the procession was not to underline the dangers of the looming conflict with Rome. Its real aim was to “construct an image of Seleucid power under Antiochus IV”, she says. She also questions whether the elephants that featured prominently in the parade were actually harnessed to chariots – and thus intended to symbolize military power – by pointing out that evidence relating to similar triumphal demonstrations suggests that they too refer to the cult of kingship. Furthermore, images of Antiochos IV were paired with depictions of Alexander the Great, perhaps intending to suggest a degree of equivalence between the ruler of Antioch and the conqueror of Asia. For Babett Edelmann-Singer, the surviving descriptions of the procession in 166 BCE and the objects displayed in its course can be read in terms of the “materialization of power”. She plans to explore this concept further in other case studies, focusing on how, in the context of the formal Roman triumph, the boundaries between subject and object become porous. Perhaps the most famous example of this is the portrait of Cleopatra, which the Roman Emperor Octavian chose as the central element in his triumphal procession following his victory over Egypt at the battle of Actium in 31 BCE. This portrait was actually a stand-in for the Egyptian queen herself, who had evaded capture by committing suicide. But the portrait was so redolent of her personality and her kingdom’s power that it in effect became an avatar. In addition to such exaltation of dead potentates, other celebrations of conquest provide examples of the degrading objectification of the living – prisoners of war, for instance, who played the role of necessary but largely insignificant props in the scene. During her three-year stay in Munich, Edelmann-Singer hopes to study cases in which the meanings transported by objects involve more than mere symbolism. She plans to test whether theories (proposed by the French sociologist Bruno Latour and others) that attribute a kind of agency to certain categories of object can be productively applied to the Classical Period. Babett Edelmann-Singer studied History at the universities of Regensburg and Leicester. She obtained her doctoral degree and completed her Habilitation in Regensburg. Having held academic posts since then in Passau, Erlangen-Nürnberg and Osnabrück, she is currently serving Interim Head of the Institute of Ancient History in Regensburg. And why did she choose to spend her stint as a Heisenberg Fellow in Munich? “Because LMU covers a wide range of specialties in the History of the Ancient World, which provide ideal points of contact with my own interests,” she says. That is true in particular for the areas covered by professors Martin Zimmermann (Ancient History), Karen Radner (Ancient History of the Near and Middle East) and Ruth Bielfeldt (Classical Archaeology), she adds. As a Heisenberg Fellow, Babett Edelmann-Singer becomes one of several recipients of prestigious awards for research in the Institute of Ancient History at LMU. “This concentration of talent puts in a privileged and uncommon position,” says Karen Radner, who received an Alexander von Humboldt Professorship, Germany’s highest international prize for research, in 2014. Last year, Assyriologist Enrique Jiménez from Yale University won the Sofja Kovalevskaja Prize awarded by the Alexander von Humboldt Foundation. He is now working with Karen Radner, and is setting up a research group dedicated to the assembly of a corpus of the Babylonian poetry documented in cuneiform texts. In 2015, the Humboldt Foundation awarded the Anneliese Maier Prize for Research to Angelos Chaniotis of Princeton University. Chaniotis is an expert in epigraphic Greek texts, and the award is coupled to a five-year collaboration with LMU’s Professor Jens-Uwe Krause.